Posted on Wed, Feb 8, 2012 : 9:56 a.m. 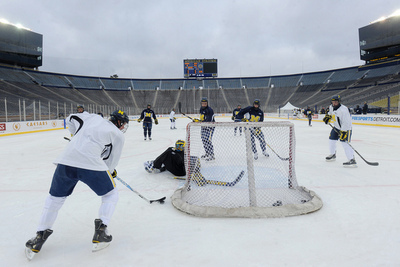 The 2013 NHL Winter Classic will be at Michigan Stadium. The University of Michigan Board of Regents voted unanimously Wednesday morning to lease Michigan Stadium to the National Hockey League for up to $3 million for the annual outdoor hockey game that will be held Jan. 1, 2013, with an alternate date set for Jan. 2. The NHL will require use of the stadium from Dec. 1 until Jan. 2. Michigan Stadium hosted the Big Chill in 2010, and now looks forward to the Winter Classic in 2013. Many regents and University President Mary Sue Coleman noted how pleased they were to have found a way to bring additional revenue into the university. While it has long been rumored that the game will involve the Detroit Red Wings and Toronto Maple Leafs, the teams were not specified in the lease agreement. Regent Denise Ilitch, whose father, Mike Ilitch, owns the Red Wings, recused herself in the vote to avoid any perceived conflict of interest. The NHL has scheduled two press conferences for Thursday. The first, scheduled for 10:30 a.m. at Comerica Park in Detroit, will be televised live by the NHL Network. The second will be held at Michigan Stadium at 1:15 p.m.
"While I have no direct interest, it is well known that my family has interest in the Detroit Red Wings," Ilitch said. Michigan athletic director Dave Brandon confirmed in January that he was involved in discussions with the NHL regarding the Winter Classic, but said, "there are a lot of complex circumstances that need to be ironed out, before anything moves forward." Brandon said at that time that he had been approached by the NHL about playing host for what would be the league's sixth annual New Year's Day outdoor game. One of those complications was liquor sales. Brandon said the university will utilize one of its 12 special one-day liquor licenses to have a temporary license for the game. Brandon said the city sees roughly $14 million in spinoff revenue on a typical football Saturdays, but expects more to be generated by the event. "This I actually would suggest would be greater," Brandon said, adding that a national event will bring more outsiders into Ann Arbor and that a noon start would likely force them to stay the night. He, however, made it clear that ticket sales and any revenue from the event itself will go to the NHL. "This is purely an NHL event," Brandon said. "All of my friends who are out there wanting to hit me up for tickets.... I don't have any." The university will be responsible for providing and managing its usual football Saturday support services. Brandon also noted that the NHL has agreed to donate an undisclosed amount to the university for student scholarships. Reporter Kellie Woodhouse contributed to this article. Contact Pete Cunnigham at petercunningham@annarbor.com or by phone at 734-623-2561. Follow him on Twitter @petcunningham. Thu, Feb 9, 2012 : 8:04 p.m.
Thu, Feb 9, 2012 : 3:53 p.m.
&quot;Brandon said the city sees roughly $14 million in spinoff revenue on a typical football Saturdays, but expects more to be generated by the event. &quot;This I actually would suggest would be greater,&quot; Brandon said, adding that a national event will bring more outsiders into Ann Arbor and that a noon start would likely force them to stay the night.&quot; how is this any more &quot;national&quot; than a home football game? You have a home team (Red instead of Wolverines) and a visiting team, (Maple leafs instead of _______) . Indeed I would argue that Hockey is a niche sport so its less of a national game than the football team playing a home game. Fri, Feb 10, 2012 : 6:15 p.m.
your describing an international event. And try getting a local motel room on a Football Friday/Saturday night. Thu, Feb 9, 2012 : 5:31 p.m. The vast majority of attendees of a Michigan football game live within driving distance of Ann Arbor. Most of them do not stay the night. in town. Expect at least 1/2 the tickets for this event to be sold in the greater Toronto area, and they all have to eat and sleep somewhere. The NHL should hire the UM band to perform between periods. They are great musicians and, probably, really fun to watch marching on ice. Thu, Feb 9, 2012 : 8:56 a.m.
Thu, Feb 9, 2012 : 5:27 p.m.
Thu, Feb 9, 2012 : 4:28 a.m.
Do more of this! Rent out the stadium for concerts. Metallica at the Big House would be a blast! Thu, Feb 9, 2012 : 2:26 a.m. I sure hope Don Cherry is in the House for this one! It better be Molson's from Canada, or Labatt's, anything else would be atravesty, except for maybe Stroh's. Also, how about the irony if Michigan is in a Bowl game on the 1st of January.The local bars could have had two huge days, but instead get one massive one. Thu, Feb 9, 2012 : 2:17 a.m. If the NHL breaks Michigan's hokey attendence then this was a terrible idea. To give up that title had to be worth much more than 3 million. Maybe 3 billion would be more like it. Lets face it the big house is a one of a kind venue. Little 85000 seat stadiums are a dime a dozen. You want to set the record you need the big house and messing with Red's records should not be taken so lightly. Perhaps another Big Chill will be in order. Oh Mr Brandon you do have your suite so don't say you have no tickets. My money says you will be there. Thu, Feb 9, 2012 : 12:34 a.m. Does anyone want to guess if they are going to serve Budwieser or Miller products? Thu, Feb 9, 2012 : 2:07 a.m.
neither. canadian hockey -- molson. Wed, Feb 8, 2012 : 10:31 p.m.
Well, if the UM does this 100 more times, the new stadium is paid off.. Wed, Feb 8, 2012 : 10:24 p.m.
i want tickets, i want tickets, i want tickets. Wed, Feb 8, 2012 : 9:56 p.m.
it's called revenue and everybody likes that. Wed, Feb 8, 2012 : 9:43 p.m. This NHL event at Michigan Stadium appears to be accepted, by at least the posting readers. Not all of us are all that thrilled about the pro hockey crowd (or pro anything) at our House. However, if we are going to let these types of events occur in our House, why not someday have summer concerts at the Big House (i.e., Coldplay, U-2, etc.)? Back in the '70s and/or '80s, Crisler Arena was used for rock and pop concerts, and it seemed to work out for U-M's $ benefit. Thu, Feb 9, 2012 : 2:47 a.m.
Thu, Feb 9, 2012 : 1:23 a.m.
Concerts are impractical at the Big House. It is logistics more than anything. Crisler does have some shows, but it is hardly some great place to hold a show. Cobo, Joe Louis, Breslin, and the Palace are better facilities designed for them. Maybe with the new changes that will change, but as someone who has seen a concert at Crisler (Pearl Jam) and seen shows at just about every other similar venue within 60 miles, Crisler is not a great facility. Thu, Feb 9, 2012 : 12:05 a.m. The biggest problem with rock concerts at the stadium is the width/height of the tunnel that goes down onto the field from the parking lot. The equipment for a modern rock concert wouldn't fit, so it would have to be lifted in by a helicopter or a huge crane (at a tremendous cost), which would eat up all of the profits from the concert. Wed, Feb 8, 2012 : 11:02 p.m.
What's the difference? 2/3 of the people who attend the average football game at the stadium have no affiliation with the school whatsoever, other than geographic location. Surely you don't really think that everyone coming from downriver on fall weekends is an alumnus? Wed, Feb 8, 2012 : 6:10 p.m. Wed, Feb 8, 2012 : 7:07 p.m. Wed, Feb 8, 2012 : 6 p.m.
Beer at the Big house. The mighty dollar wins again. Wed, Feb 8, 2012 : 10:59 p.m. In the grand scheme of things, it is. More to the point, compare A2 to the other cities that have hosted the NHL Winter Classic, and you'll get a sense of how big this is. Wed, Feb 8, 2012 : 8:15 p.m. I've never heard Ann Arbor described as a &quot;sleepy little college town&quot; before! Wed, Feb 8, 2012 : 6:45 p.m. Yes, it is truly a travesty to have the international spotlight on our sleepy little college town for a record-breaking sporting event, just so they can sell a few beers. Ann Arbor needs to get over itself. Wed, Feb 8, 2012 : 5:49 p.m. Wed, Feb 8, 2012 : 5:48 p.m.
Mary Sue Coleman noted how pleased they were to have found a way to bring additional revenue into the university. MARY SUE COLEMAN, THE $ GENERATED IS NOT REVENUE TO UM - IT GOES STRAIGHT TO NHL. There are so many ways UM Athletic's can generate $ l) for ten grand get your name plate on any seat! 2) for 100 thousand bury your ashes on the 50 yard line! Wed, Feb 8, 2012 : 7:18 p.m.
UM gets $3 million for renting out a facility that would, otherwise, be sitting collecting snow (assuming it's snowing unlike this year). It's a brilliant idea and I think UM should rent out the facility for more than just this event. I'm not sure why outdoor concerts and other things are not held at the stadium regularly. This also brings a ton of money into the city of Ann Arbor. Parking, people going to eat, people staying in the hotels and many other things are a domino effect from having the game here. Wed, Feb 8, 2012 : 6:21 p.m.
She was talking about the $3 million lease as the money being generated. Wed, Feb 8, 2012 : 6:09 p.m. Wed, Feb 8, 2012 : 6:08 p.m.
ALL revenue from concessions and parking will NOT go to the NHL? Maybe some...but not all. Wed, Feb 8, 2012 : 5:51 p.m.
We could have buried Bo at the 50! Wed, Feb 8, 2012 : 5:44 p.m. Wed, Feb 8, 2012 : 8:54 p.m.
Is this something you are seriously concerned/worried about? I mean, really? Wed, Feb 8, 2012 : 6:14 p.m.
Clearly, djm12652, you have no idea about the ability of Leafs fans to drink beer while watching a hockey game, regardless of how much they've had to drink the night before. Wed, Feb 8, 2012 : 5:46 p.m.
12/01/12 thru 01/02/13? A month to set up and less that one day to take down? Wed, Feb 8, 2012 : 4:58 p.m. So who will be paying for all of the cops from Ann Arbor, Washtenaw County, and the state who normally provide traffic control and crowd control? That's going to be a pretty hefty tab when you consider everybody will be getting holiday pay. Wed, Feb 8, 2012 : 9:46 p.m.
WHO. If they paid 100 police officers $100 per hour it would cost $100K for OT in a 10 hour day. Admittedly, these numbers are excessive and exaggerated. There will probably be a line of officers wanting to cash in. The city WANTS TO BE INVOLVED. CHA-CHING!!! Have you ever been to an NHL game? It is a completely different demographic than a college football game. They can take the OT money out of beer sales. Alcohol sales will probably hit $1 million. A beer at a Red Wing game is $8.50. It would take 60,000 fans to drink 2 beers to hit that. Those numbers are not exaggerated. If you think they are then you have never been to an NHL game. Wed, Feb 8, 2012 : 8:13 p.m.
Not to worry... parking tickets, speeding tickets, towing charges will certainly cover any extra police enforcement costs; and what police officer doesn't need an extra pay check this time of year anyway? Wed, Feb 8, 2012 : 7:23 p.m.
No offense but this argument doesn't make sense. Any tax payer money that goes into paying officers to enforce the event is well voided by the amount of business, and taxes, this event brings into the city. Wed, Feb 8, 2012 : 5:54 p.m. The question remains as to WHO will be paying for the law enforcement and traffic control. The NHL and U-M might have a plan but the city will be involved. Mr Brandon thinks more revenue will raised for the area than a typical Saturday home game football game... I will have to see it to believe it. I shudder to think about a snow event occurring on New Year's Day 2013 and how the city and county will cope with keeping the roads clear. We'll have to deal with that when the time comes. Otherwise, good luck and best wishes to all involved. Wed, Feb 8, 2012 : 5:19 p.m.
Do you think both the U-M and the NHL overlooked who will be paying holiday OT? Considering this is the sixth time the event will be held on New Year's Day I am sure the issue has come up before. Wed, Feb 8, 2012 : 4:25 p.m.
Let's face it! We are now into the professionalization of UM sports. Pay the college athletes! Now I know some of oyu will say this is a professional Hockey team, not a college team. However, please tell me the difference. Thu, Feb 9, 2012 : 1:19 a.m. So since the football players bring in revenue they should be paid. What about the wrestling team? Swimmers? field hockey? These kids offer little in the way of revenue, and a LOT in the way of expenses (they are scholarship athletes as well). Thu, Feb 9, 2012 : 12:11 a.m.
Oh, come on! This again? The student athletes get a TON, as noted above by @mg0blue, which really does equal out to a ton more than the vast majority of the other 18-222 year olds on campus. Win and win. These are 18-22 year olds that get the privilege of representing themselves and the UofM on whichever athletic field/court/etc..... for FREE! Is the system perfect? No, as evidenced by the ridiculous scrutiny these student-athletes are subjected to (can't let anyone buy you a hamburger now, can you? even when you're broke as a joke...). But do you really want to see college athletics start paying their athletes (more than they already are)? Wed, Feb 8, 2012 : 10:17 p.m.
Face it man! UM is now in the professional league. We are paying coaches a million plus a year plus incentives, more than some NFL coaches are paid. Assistant coaches are getting 700-800,000 a year plus incentives and the athletes who are risking their bodies and health are getting a college scholarship which many do not complete during their 4 years. The UM reaps untoll amounts of revenue which subsidized all the other sports not to mention the marketing of is brand which generate additional revenue, now its starting to venture out to other endeavors like outdoor hockey and NHL Hockey. Tell me, is this not the professionalization of the sport. I'm not necessarily opposed to it. I just want the athletes who generate this income to benefit from it as well. Wed, Feb 8, 2012 : 9:33 p.m.
&quot;...UM sports under Dave Brandon is now a professional operation...&quot; I hate to rain on your rant but sports at the U-M is no more or less professional than before. What has changed? A revenue producing event at a sports stadium? What about concerts at Crisler? Those are okay? Wed, Feb 8, 2012 : 6:34 p.m. I'm not sure how leasing the stadium to the NHL for one day to raise extra revenue for all it's intercollegiate sports fits in with your argument about U-M sports being &quot;professionalized&quot;. The fact is almost all U-M sports don't take in much if any revenue and cost a lot of money in coaching, facilities, training, and travel each year. Events like this help to fund the ability of many student-athletes to pursue their sports while earning a degree. Sounds like a win-win-win situation to me. The UM football program subsidize all of its sports programs except maybe basketball. Tell me. Is this not a professional operation? UM Hockey may only be a break even operation but I guarantee you it does not suffer support from the professional revenues generated by football. Face it guy, UM sports under Dave Brandon is now a professional operation. Pay the athletes! Wed, Feb 8, 2012 : 6:13 p.m. These students already receive probably upwards of 100k a year, if you were to calculate everything they get. Tuition, room and board, books, top notch medical care, state of the art training facilities, free airfare/bus transportation, hotel accommodations, university clothing, and probably countless other benefits that other 18 year old kids don't get. Wed, Feb 8, 2012 : 5:13 p.m.
&quot;...professionalization of UM sports....&quot; The difference is Zetterberg, Datsyuk and Lidstrom make $5 million+ each per year and generate PROFIT of millions. The last report I saw U-M hockey was slightly above break even. Wed, Feb 8, 2012 : 4:24 p.m. It is all about the money. It sounds like a win-win situation for the University, City of Ann Arbor and NHL. It will be interesting to see how many fans attend this event. Parking will be much more limited. The city might have to cough up some serious holiday pay for traffic control and policing the area. I will be interested to read follow up stories on these logistics. Wed, Feb 8, 2012 : 4:37 p.m. This event will sell out, and then some. If they put all 110,000 tickets up for sale at a lemonade stand in downtown Toronto during a hailstorm, it would still sell out in a matter of hours. Wed, Feb 8, 2012 : 4:15 p.m.
A few questions: will the money go into the University general fund or to the athletic department (same with fellowships), and who will pay for security and traffic control? It is a strange day to hold anything in Ann Arbor: on New Year's Day the city is usually dead, with most shops and restaurants closed ... Things may have to change. Thu, Feb 9, 2012 : 11:30 a.m. The whole week between Christmas and New Years is vacation time at UM. That means that UM employees, including police and security will get overtime pay. Will that extra pay come out of the athletic departments budget? Wed, Feb 8, 2012 : 9:54 p.m. The demographic that attends the game is not the one would spend the day shopping at the mall or downtown. The bars that are open on New Year's Day (which is most) will enjoy the windfall at the expense of those that are not open. Wed, Feb 8, 2012 : 7:21 p.m.
Not to mention a lot of people will probably be staying the night here for the game. So sales are not only calculated from the day of, but new year's eve as well when people are out in the town. Wed, Feb 8, 2012 : 5:40 p.m.
a number of shops besides restaurants and souvenier boutiques? I believe a number of shops that are normally closed will be open for a special event like this. Wed, Feb 8, 2012 : 4:08 p.m.
Thu, Feb 9, 2012 : 1:14 a.m. It is likely undiscolosed because it is an unknown. It could be negotiated ats a % of ticket sales, or % of alcohol sales or who knows. As for how the $3 million will be spent, it will go in the general athletic fund which pays for non revenue sports, and any other expense they have. The athletic department is a separate entity when it comes to finances. They pay their own way. Wed, Feb 8, 2012 : 7:15 p.m.
Money generated from the athletic facilities, I'm assuming, goes back to the athletic department. And I think that's how it should be. Wed, Feb 8, 2012 : 4:02 p.m.
Not a big surprise but glad they ok'd it. Wonder how much the tickets will be? I went to the UM vs MSU outdoor game and it was a blast. This should be great too, Two of the Original Six playing outdoor hockey. Wed, Feb 8, 2012 : 4:14 p.m.
Could agree more. Awesome game at an even better venue!! Wed, Feb 8, 2012 : 3:59 p.m.
Looks like a great time ahead. I'd like to see a few imperial stouts and barleywines, available. Go Wings! This going to be the Big Chill on roids! Wed, Feb 8, 2012 : 3:53 p.m. It's more than likely that Ilitch recused, not refused, her vote. Maybe MLive can buy its reporters dictionaries along with smartphones and laptops. Wed, Feb 8, 2012 : 6:07 p.m. Thanks everyone for your feedback. The word has been changed. Wed, Feb 8, 2012 : 6:01 p.m. Wed, Feb 8, 2012 : 5:53 p.m.
Denise Illitch did refuse to vote... so technically that verbiage works as well. Could the author have used a more fitting word? Sure. Does it bother me enough to disparage MLive over? Certainly not. Actually, the laptop smartphone may have caused the error (spell check). Spell check does not recogize &quot;recused&quot;. Wed, Feb 8, 2012 : 4:35 p.m.
John, proper word usage is one of the foundations of good journalism. I suppose you'd accuse willywonka of smugness if he criticized a doctor for not knowing how to make an incision? Wed, Feb 8, 2012 : 4:19 p.m. Accuracy does not have a price. Wed, Feb 8, 2012 : 4 p.m. But what can we buy them to turn down the smugness level of their readers? Wed, Feb 8, 2012 : 3:49 p.m. Wed, Feb 8, 2012 : 10:30 p.m.
Ah yes, running over to the party store across Main to buy more beer at halftime...Those were the days!